In each Transitions section of Preservation magazine, we highlight places of local and national importance that have recently been restored, are currently threatened, have been saved from demolition or neglect, or have been lost. Here's one from Winter 2017. 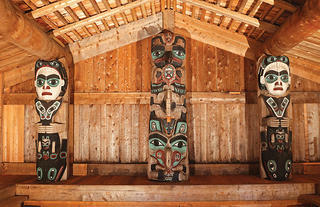 The North American Haida people believe this longhouse in the village of Kasaan, in southeastern Alaska, to be the last remaining traditional Haida structure in the United States. It was built around 1880 by Chief Son-I-Hat, and restored by the Civilian Conservation Corps between 1938 and 1940. The corps replaced a great deal of the original cedar, which had badly rotted in the region’s damp climate, but they were able to preserve the four original house posts holding up the structure’s roof. The most recent restoration took about five years, using grant money from Alaska’s Rasmuson Foundation along with funding from the tribal transportation department and individual donations, for a total cost of about $1.4 million. Using traditional methods, Haida woodcarvers preserved much of the existing structure and replaced wood that was unsalvageable. Work included treating insect damage to the house posts and replacing a historic totem carving that had been stolen on an unknown date.